We’ve been hard at work the hubby and I. We’ve managed miraculously somehow to move to our new house with two kids (a big thank you to our mom’s for watching the girls). You don’t realize how much you’ve accumulated over the years until you need to move – especially when you soon realize that both you and your spouse might be pack rats. Alas, a picture of our new house . . . isn’t it pretty? We think so =) Sorry for the sun flare … between everything going on, I didn’t have time to properly set up for exposure or have a lens hood (photography speak). After over two years of searching and 100 days worth of waiting to close, we finally have a “real house”! Its a four bedroom, three and a half bathrooms on a little less than an acre lot. What really sold on on the house were the front and back views of the house. There is a walking trail in front, which means no neighbors in front; there are trees in back that hide the neighbors behind us that are apart of another subdivision. Don’t get me wrong, I like having neighbors – but I also like my privacy and having views of something other than another house. We also just found out that the house next to us that was for sale also sold! The current neighbors told us that they sold it to a younger couple like us who was expecting their first child. And he said the neighbor next to him has a young child that may be of babysitting age! How exciting! As mentioned in this post, this house was a short sale. Which meant that it was just a few steps above being a foreclosure. The sellers built the house, then the housing market took a dump, and the house was no longer worth the value of what they still owed on the mortgage. So, the sellers had to (a) cough up the difference or (b) see if the bank who held held the mortgage would eat the cost – the short sale. When we initially saw the property online, it was fully furnished. Well, when our realtor showed it to us, it was vacant. We later found out that the sellers filed bankruptcy and moved out of state. When they moved out of the house, let’s just say they weren’t very careful when moving their furniture out. That’s one thing that’s similar with respect to foreclosures and short sales – the sellers can’t afford their home, so they have no need to keep it “maintained” in good condition. I mean, it wasn’t in too terrible compared to the foreclosures that the hubs and I have looked at. Our house just needs some putty work on the drywall and new paint … everywhere. Yard/Grass. The grass needs a lot of work. Lots of brown spots everywhere. It doesn’t help that the current neighbors are retired and pretty much work on their yard every day of the week literally. We’re getting quotes right now to get some lawn service guys to do it this first year – and this was something hard for Ryan to swallow. I somehow managed to convince him that its “okay” to hire someone to do work and that you don’t have to DIY – especially when hunting season is around the corner =) (Guess which part of that made him consider hiring someone was okay). Walls. The sellers were the originally owners, so they picked everything out on the house. Their wall color choice just made the house seem really really dark. The trim around the house is a khaki color, but they chose this cream color for the drywall that darkened the room. So we are planning on painting the whole house. We got quotes to see how much it would cost to paint just the “public” areas. The quotes were between $1500 – $2500. Um, no thank you. We’ll just do it ourselves or get our friends to help for a case of beer. A big thank you again goes out to Ryan’s momma for painting Ansley’s room (pictures to come later). There were also huge holes that we need to patch around the house. I don’t know if someone got mad with a hammer, but these were pretty good dents on the dry wall. Also, I’m assuming that their realtor probably told them to touch up the paint in the house. The reason why I say this is because there are patches of paint on the trim and the wall that look the same “shade” but isn’t quite a match. We then found some paint cans downstairs for the house colors – and I’m thinking that the paint aged or they didn’t shake it well enough. In the living room, if you look up, you can see how there are two tones to the paint. Obviously, I’m adding that to the ever growing honey do list. Hardwood Floors. When the sellers were dragging their stuff out, they didn’t take care to not scratch the floors. They didn’t leave us a fridge, but they did leave us floor marks showing us where they slid the fridge out. The scratches were pretty bad. We decided that if we had to do one thing before we move it, it would be the hardwood floors. This was not a DIY project – so I had to find a contractor. I spent $28 for an annual membership on Angie’s List. That was the best $28 bucks that I’ve spent. At first, I was skeptical to see if it was really real reviews. Oh – yes they were. People were quite honest about their good and their bad experiences. That’s where I found Fish Flooring. Shad is the owner of Fish Flooring and at the time had 23 reviews – and they were all A’s. I had him and another competitor come out to quote (this competitor was a recommendation from a friend). They both were very knowledgeable and gave me a quote within 24 hours. A few hours after sending me the quote, I decided to look up the competitor – and he had some As, but also D’s and F’s. Whoa. So I was a little hesitant on him. 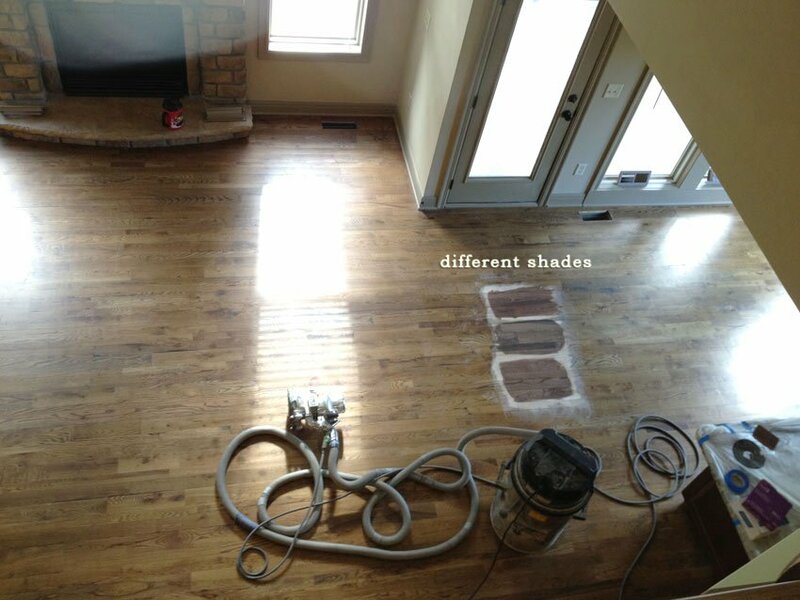 Then I saw that on Angie’s list, Fish Flooring (Shad) had a 10% discount for Angie’s List. So, I was sold on Fish Flooring! Anyway, Shad came out the next week to finish the job in three days. Here is the after photo – no more scratches – yeah! 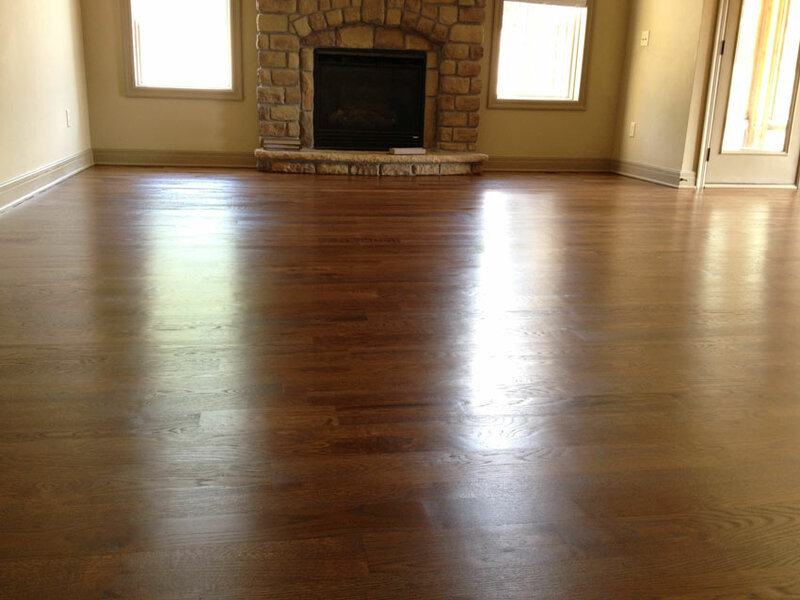 Basically, the process is that they first sand down the floors and remove the current gloss and stain. I then got to choose my own stain color. Then they re-patched, stained, then put two coats of poly on. What was really cool was that when they sanded down to the wood, the wood was natural color and very light – which lightened up the entire room. Shad told me light/natural wood is great but if you choose to go that way, it shows more of the imperfections in the wood. We decided to go with a darker stain with a little red in it. One project down, fifty more to go =) Next up, appliance purchasing and Ansley’s room! Stay tuned. Your house is amazingly gorgeous!!! I cant wait to see it in person! !